Come see a great show all about the sport of tennis! •	Burnet Gallery, Le Méridien Chambers, 901 Hennepin Ave., Minneapolis, Minn.
•	FREE Opening Reception 6-8 p.m., Sat. May 17. •	Exhibition runs through, July 6, 2014. MINNEAPOLIS – Duluth native, and current San Francisco -based artist, Andrew Witrak, returns to Minnesota, Sat., May 17th and is bringing a bit of summer with him – regardless of our rather erratic spring. But all is not sunny and bright in this show that seems to embody dark humor at every turn. Witrak’s mixed media solo show, Souvenir evokes several elements synonymous with luxurious tropical travel, but always with an edge or twist or some kind. A Swiss cross made from aluminum tubing and plastic webbing brings to mind both a beach chair and the iconic symbol for first aid. A blue and white drawing of a hotel hanger looks oddly decapitated without the more traditional hooked top, while another drawing of a blank door hanger leaves the viewer with the urge to fill in the blanks. A brightly striped beach towel (made out of fiberglass) appears laid out on a beach, but stiff and abandoned with no sunbather nearby. Souvenir opens Sat. May 17th with an opening reception from 6-8 pm. The event is free and open to the public. The show runs through July 6, 2014. Gallery hours are 11 am to 9 pm. daily and by appointment. Andrew Witrak is a Duluth native, now based in San Francisco. He received his BA from St. Olaf College, Northfield, Minn., and his MFA from Mills College, Oakland, Calif. He is a two time nominee for the San Francisco Museum of Modern Art Seca Award, and in 2009 received a graduate fellowship from the Headlands Center for the Arts and the Jay DeFeo Prize. His recent 2013 exhibitions include Proximities, a group exhibition at the Asian Art Museum, San Francisco and Luminous, another group show at the Steven Wirtz Gallery, San Francisco. In 2012 his work was featured in a solo exhibition at Unspeakable Projects, San Francisco, as well as in Oakland Now, at Spoke Art, Oakland, Calif., and Art Pad SF at the Phoenix Hotel, San Francisco. His work is also included in the Tweed Museum of Art, Duluth, Minn.
Burnet Gallery is a commercial gallery featuring local, national and international contemporary artists with new shows about every six to eight weeks. The Gallery is located in Le Méridien Chambers, an award-winning art hotel located in downtown Minneapolis. Editor’s Notes: Hi-res and additional images are available upon request. I'll be showing new work at the Asian Art Museum in San Francisco. Show dates are May 24- July 21.
proximities:what time is it there? Hope to see you Thursday, September 6th at the opening reception : 6-9pm. I have donated an "Andrew Witrak Complete Works" mailer to the LAB auction, taking place on May 12, 2012. 2012 ART PAD SF, May 17-20, 2012. I have moved from my Emeryville, CA studio over to a bigger, better equipped space in San Francisco. I currently share the space with 6 other artists: Annie Vought, MIke Arcega, Jesse Houlding, Anthony Ryan, Hannah Ireland, and Josh Warren. I have been working on many projects since i've moved in, and am excited to get the new work into the world! come check out my piece in this pop-up show at the Chapel of the Chimes. Would love to see y'all there for the opening. It's a great space. Featuring Work By: Maggie Simpson Adams, Glenna Cole Allee, Rachel Dawson, Victoria Heilweil, Elyse Hochstadt, Karrie Hovey, Phil King, Marya Krogstad, Yuki Maruyama, Emmanuelle Namont Kouznetsov,Jessica Pezalla, Luther Thie, Linda Trunzo, Andrew Witrak & Kathrine Worel. Poignancy, playfulness, and sharp insights into the nature of the Eternal are the common threads used to weave a series of site specific mini-installations through chapel niches. I will be collaborating with my wonderful studio mates, the amazing artists Meagan Donegan, Gina Tuzzi, and Annie Vought, to make an installation for the East Bay Express Party- August 6, 2010- look for our studio moniker GAMA. hint: light, mason jars, cube. I think it will be pretty great. come if you can. The 2009/2010 Graduate Fellows Exhibition is open May 9 - June 6. Gallery visiting hours are Tuesdays through Fridays and Sundays, Noon - 5PM. Each year, Headlands awards a Graduate Fellowship to an exceptional graduate from each of its partner academic institutions. These awards, intended to help emerging visual artists segue from academia to the life of a working artist, provide a free studio space for one year and the opportunity to participate in Headlands' creative community. This exhibition, guest curated by Misako Inaoka and Heather Marx, celebrates these artists and the work made during their year at Headlands. Headlands Center for the Arts is located in Fort Barry in the Marin Headlands. This event will take place in Building 944 on the 3rd Floor. Our street address is 944 Simmonds Road, Sausalito, CA. For directions, visit headlands.org or call 415-331-2787 x2. Seven artists and faculty from Bay Area Masters of Fine Arts Programs discuss the role and influence of graduate art programs in their work and artistic development. Moderated by Executive Director Kathryn Reasoner with exhibition artists Aaron Maietta, MFA UC Berkeley; Andrew Witrak, MFA Mills College; Sandra Ono, MFA Mills College, and Patricia Patterson, MFA San Francisco Art Institute, and faculty members Annabeth Rosen, Graduate Advisor, Department of Art & Art History, UC Davis; Gail Wight, Associate Professor and Director of Graduate Studies in Art Practice at Stanford university, and Glen Helfand, Adjunct Professor, Fine Arts, California College of the Arts and Lecturer, Mills College. “Mirror Images” is an exhibition organized by Charles L. Moffett around Ian Burn’s Mirror Piece, 1967, a single work of art from the collection of Steven Leiber. In conversation with Mirror Piece, the exhibition will include three identical books, which contain all of the submissions that were received following the curator’s call for responses to Burn’s work. The exhibition will take place at Silverman Gallery on April 28, 2010, with a reception from 5-8PM. The jury for the MFA Selections exhibition chose my work for the exhibition at di Rosa March 6- June 5, 2010. I am very excited and honored to be included alongside 9 other artists, including the great Gina Tuzzi! An exhibition showcasing the work of artists who recently completed their Master’s of Fine Art degrees at Bay Area art schools and colleges. The artists included in the exhibition were chosen by a jury of arts professionals, from a pool of artists nominated by faculty from regional institutions. Artists include Joanne Hashitani, Leigh Merrill, Sandra Ono, Gina Tuzzi and Andrew Witrak from Mills College; Carina Baumann and S. Patricia Patterson from San Francisco Art Institute; Jina Valentine from Stanford University; Aaron Maietta-Dehaven from UC Berkeley; Josh Short from UC Davis. Reflecting the diverse voices of young artists working today, MFA SELECTIONS will include works in a broad cross section of media, from painting and sculpture to video and installation. 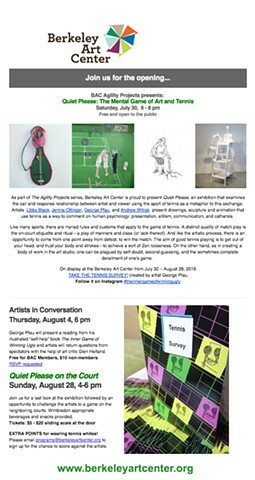 The works on exhibition are chosen with the artists, who may create and/or select works especially for the show at di Rosa’s Gatehouse Gallery. Ninth biennial "From the Heart," a collection of artwork by members of The Hamlin School faculty and staff. I am very lucky to have been selected for a Graduate Fellowship Residency at The Headlands Center for the Arts starting July15 2009 - July14 2010: my studio is up the hill in building 960- come visit! May 3, 2009 through May 31, 2009. Opening reception, Saturday, May 2, 2009, 7 to 9pm. Come experience Young Americans, the 2009 MFA Thesis Exhibition at Mills College in Oakland, California. Andrew Witrak, Annie Vought, Brian Caraway, Esther Traugot, Gina Tuzzi, Joseph Berryhill, Kate Pszotka, Leigh Merrill, Modesto Covarrubias, and Steuart Pittman. The Mills College Art Museum is proud to present Young Americans, featuring works by the 2009 Master of Fine Arts degree recipients. This exhibition provides an opportunity to see works in all media created by a promising group of emerging artists eager to share what they have been developing during their graduate program with a broader audience. This year’s exhibition is curated by Terri Cohn, Bay Area writer, independent curator, and faculty member at the San Francisco Art Institute. In the brochure accompanying the exhibition, Cohn observes that the ten artists who will receive their MFA degrees this year are unusual in their choice to name their MFA show Young Americans. The title situates them as citizens emerging within a national context, and suggests that in addition to their collective experiences as youthful Americans—with the burden of history this implies, this identity also affords them an intrinsic right to personal freedom. A desire for a sense of security—articulated in various metaphoric and formal ways—is one fundamental concern expressed through their work. Kate Pszotka’s fascination with the idea of home and stability has motivated her consideration of family members, which she represents iconographically with everyday objects, realized as paper cut out line drawings. Gina Tuzzi’s seemingly simple, naïve structures—houses, barns, huts—stacked on trucks to become rolling homes, or represented as drawings, underscore a sense of safety and comfort in the mythic past of coastal California. In related ways, Esther Traugot’s knitted tree sweaters and forest of trunks with projected flower pattern coverings suggest the utopian potential of the natural world, as well as her desire to protect and preserve it. By contrast, Leigh Merrill’s large-scale photographs explore the relationship between fantasy and reality in our constructed environments, blending urban and suburban architecture and landscape styles, or cut and artificial flowers. Modesto Covarrubias has spent much time creating rooms and shelters as means to define and express his fears, insecurities, and sense of vulnerability, while Andrew Witrak’s sculptures pose slightly ridiculous solutions to the question of what can provide some fleeting impression of safety or exit: lifejackets sewn together; a beeswax boarding pass. Annie Vought translates found handwritten letters to wall-mounted versions created with cutout text, fragile portraits of each author that are reminiscent of silhouettes. Joseph Berryhill’s paintings express a tension between order and chaos, proposing ways that animate experience can be distilled into visual experience. Steuart Pittman’s abstract paintings reflect what he calls a “longing for quiet beauty in a chaotic, high-speed age,” while Brian Caraway creates tools and rules to implement his mixed media works, relating his process-based investigations through texture as they change over time. As artists who have come of age in the extraordinarily volatile circumstances of the 21st century, these individuals focus on singular modes of expression as a way to make sense of and stake a claim in their separate and collective futures. Their works express a sense of hope and possibility, going forward into their lives as young Americans. In addition to an essay by Cohn, the illustrated catalog for Young Americans contains an essay by critic Glen Helfand. This publication will be available in the gallery during the course of the exhibition. The Mills College Art Museum, founded in 1925, is a dynamic center for art that focuses on the creative work of women as artists and curators. The museum strives to engage and inspire the diverse and distinctive cultures of the Bay Area by presenting innovative exhibitions by emerging and established national and international artists. Exhibitions are designed to challenge and invite reflection upon the profound complexities of contemporary culture. Admission is free for all exhibitions and programs. The Murphy & Cadogan Fellowships in the Fine Arts are annual awards sponsored by The San Francisco Foundation to assist art students in funding their final year of graduate studies. In partnership with the Foundation, the Arts Commission Gallery is committed to showcasing works by outstanding Bay Area art students through the annual fellowship exhibition. The jurors for this year’s awards were Lisa Dent, Charles Mobley, Denise Ruiz and Meg Shiffler. Bay Area colleges and universities represented by the twenty-four 2008 recipients are the Academy of Art University, California College of the Arts, Mills College, The San Francisco Art Institute, San Francisco State University and Stanford University. Media represented in the show includes drawing, film & video, installation, mixed media, painting, printmaking, performance and sculpture. Duluth is a seaport city in the U.S. state of Minnesota and the county seat of St. Louis County. The city had a total population of 86,918 in the 2000 census and the metropolitan census including outer suburbs and villages was estimated to be roughly 184,000. At the westernmost point on the north shore of Lake Superior, Duluth is linked to the Atlantic Ocean 2,300 miles (3,700 km) away via the Great Lakes and Erie Canal/New York State Barge Canal or Saint Lawrence Seaway passages and is the Atlantic Ocean's westernmost deep-water port.